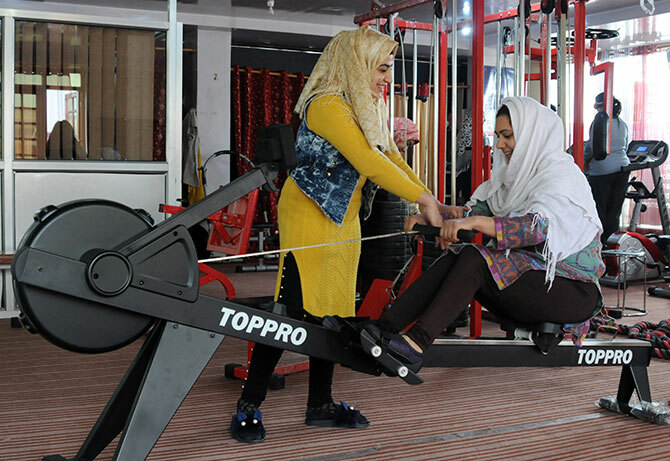 In Mehreen Amin's gym, Kashmiri girls who earlier had no access to female trainers, are 'gymming' their way to fitness. At 21, Mehreen Amin started a gym in Srinagar because there was no gym in the city she could go to. "All the gyms were unisex. They would keep a small slot for an hour or so for women only. I wasn't comfortable with a male trainer," Mehreen tells Rediff.com's Archana Masih over the telephone from Srinagar. Mehreen rented space and opened an all women gym in downtown Srinagar in 2016. The idea originated from her own experience with an unhealthy lifestyle and weight gain. Mehreen had gone to spend some time with her brother in New Delhi and joined a gym because she had gained considerable amount of weight. The stint at the gym brought her weight down by 30 kilos in a few months. It also generated an interest in fitness and spurred her to join a year's course in Delhi to become a fitness trainer. On her return to Srinagar, she realised she had started putting on weight again. Uncomfortable with the gyms in town that were dominated by men, she thought she would walk herself back to health. "But people stared and scanned. Kashmir is a conservative society. I felt uncomfortable going for walks alone," says Mehreen. IMAGE: "Women feel comfortable here. The youngest member is 10 and the oldest 60," Mehreen says. 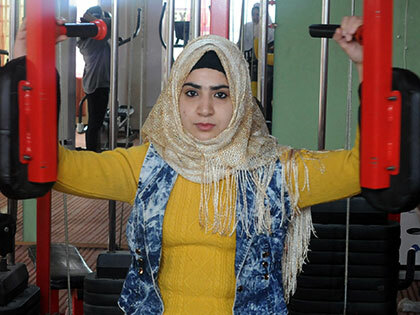 Realising that there were no women fitness trainers or all women gyms in downtown Srinagar, she thought of starting one. But she was too young to be taken seriously. Her idea was scoffed at in the beginning. After much persuasion, her family agreed but it was very difficult to find a space to rent. She almost gave up and went to enroll in a MBA in the local college. The day she went to collect the admission form, she saw a notice for a place on rent opposite the college. On enquiring, the man agreed to rent it out for 20,000 a month and asked her to send someone older to finalise the deal. Her uncle spoke to the owner and Mehreen finally could start her dream project. Her parents pitched in with the initial investment with which Mehreen bought some gym equipment and opened the gym. In the beginning, there were only two members and many naysayers. "People ridiculed me and said it was a waste of money. They told my parents it would have been better if they had given it to their son to start a business instead," says Mehreen. People did not expect it to succeed, but success did arrive. Word of mouth brought more women and today 100 members come to the gym every day. The fee is Rs 2,000 a month. "Those same people who said I would not make it now say they always knew that this girl would succeed," says Mehreen, who has repaid half the investment her parents made and now has a self sustaining business. IMAGE: The gym is self sustaining now and also provides zumba, yoga classes. Every morning Fitness Hub opens at 6 am with three batches in the morning and three in the evening. Mehreen spends her entire day at the gym training patrons and giving diet consultations. There is another lady trainer. "I come daily and have lost 6 kg. I feel stronger and more confident as a person," says Shagufta, a student who enrolled in the gym recently. "This is also a very safe place for women," says the science student who motivated some of her friends to join as well. Mehreen says the area is the safest place in all of Kashmir and never has she felt insecure. Sometime, tourists also have come to the gym. With elections due next month, she says there is no disruption in the scheduled running of her gym. She has not voted in any election so far -- this time too, she says, she won't. "It does not make any difference here. I am not interested in politics," she says. "My aim and passion is fitness and my gym. I am happy I am making a difference to women's lives." IMAGE: In winter or summer, Mehreen comes to the gym every morning at 6 am and leaves at 8 pm. Eat less junk food, especially roadside Chinese. Eat more salad and fruits. Rice for lunch and roti for dinner.